There are more than 13,500 public school districts, serving approximately 50 million students in the United States. 90% of American students attend public schools. 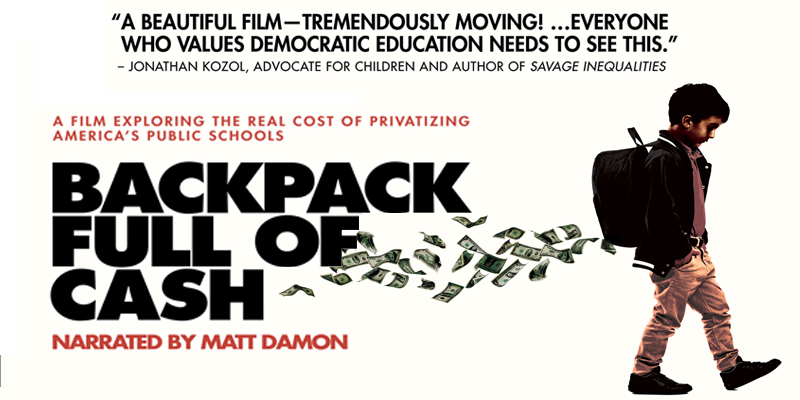 Public schools represent a huge block of government spending, totaling over $600 billion yearly. Charter schools are publicly funded but privately run. There are about 6,800 charters (more than 7,000 in 2017-18) 1 in 44 states — (43 states and DC have charter schools2), serving almost three million students, (nearly 3.2 million students1 or more than 6 percent of the nation’s public school students (correct in 2015-16)3. Charters are especially strong in urban areas. 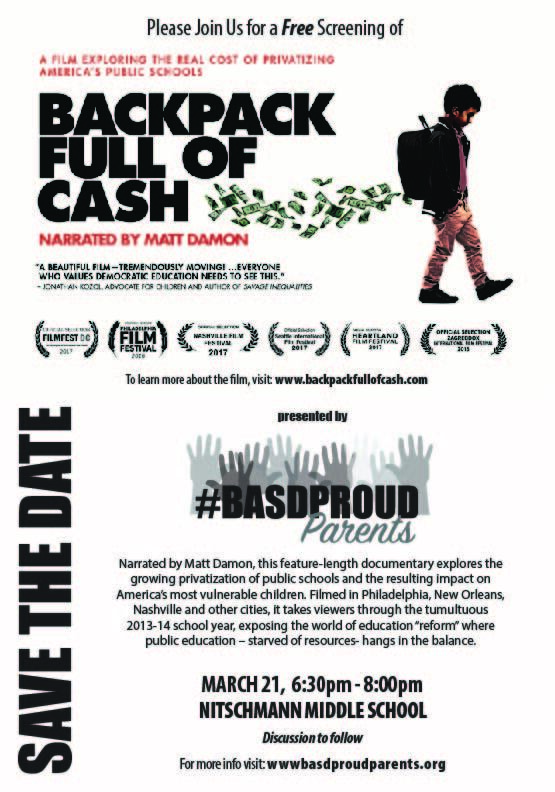 Philadelphia, whose struggle is highlighted in Backpack Full of Cash, had 86 charter schools in 2013-14. Vouchers use taxpayer dollars to pay tuition at private, mostly religious schools. There are 61 different programs in 28 states that directly or indirectly fund private schools. Roughly 1.3 million students took part in the programs in 2017. Concern has grown over charter schools that erect barriers to enrollment, such as selective marketing or limited time frames. At one Philadelphia charter school, applications were available only one day a year, to families attending an open house at a suburban golf club. Studies consistently note that, overall, test scores are not significantly different in voucher, charter, and public schools. At least 23 states provide LESS funding per student than before the 2008 Recession, according to a recent study by the Center for Budget and Policy Priorities. Charters and private school vouchers leave even less money for public schools which the vast majority of children – including the most vulnerable – depend on. In an unprecedented move, President Trump has pledged to spend $20 billion to promote school “choice”, including charters and vouchers. Education Secretary Betsy DeVos, a Michigan billionaire and GOP donor, is a longtime advocate of vouchers, online schools and charters, including those run by for-profit companies.